For the longest time, we’ve all thought that the massive Wakanda-set battle in Avengers: Infinity War was because the technologically advanced nation stands the best chance at defending against Thanos. But in actuality, the real reason so many of Marvel’s heroes congregate on Wakanda should worry everyone about what goes down in Infinity War. Pretty serious Infinity War spoilers follow, so consider yourself warned. In an interview with i09 published on Monday, the actor who plays Vision, Paul Bettany, revealed that the hero gets attacked early in the movie, and he flees to Wakanda with other Avengers not just for protection, but also for surgery. “These bad guys are trying to get the stone out of my head and so Wanda and I fought them off, and then we’ve ended up here for surgery,” Bettany said, before letting slip that they “try” to do something “in Shuri’s lab” that sounds fairly risky. Remember that the second big Infinity War trailer revealed this quick shot of Shuri standing over Vision’s body with some kind of schematic. Shuri probably explains how Vision's physiology works in 'Infinity War'. 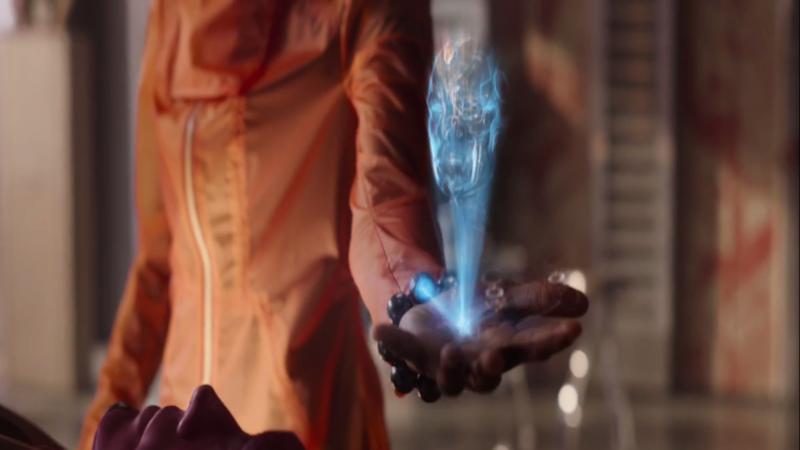 It’s not crazy to think that the Avengers enlist Shuri’s help to see if it’s possible to remove the Mind Stone from Vision’s head without killing him, which would preserve his safety at the very least. But she might also have to do some extensive repairs if he’s damaged — or would we call it “wounded?” Who better to perform surgery on a man made of vibranium than the world’s foremost genius expert on the metal: Shuri. Probably very early in the movie, Vision and Scarlet Witch get attacked by Thanos’s children Corvus Glaive and Proxima Midnight. (They both seemingly have magical weapons that might be able to pierce even vibranium skin, by the way.) This’ll be when Corvus Glaive digs his spear right into Vision’s forehead. This also might be when Captain America shows up to help, emerging from the shadows after catching Proxima Midnight’s thrown spear in mid-air. If you noticed the following relatively new scene from a TV spot released earlier this week, you can see Vision walking with Scarlet Witch, Captain America, and Black Widow while he’s visibly clutching his abdomen. Vision also does this when these four get to Wakanda with Bruce Banner, Falcon, and War Machine. This points to Vision getting severely wounded in this confrontation, which also explains why there isn’t much footage of him fighting on the frontlines of the battle. Vision has a really tough time in 'Avengers: Infinity War'. So when Tony Stark talks about using what Thanos wants to their advantage, he’s talking about hiding Vision in Wakanda and protecting the Mind Stone. Which also means that Wakanda almost definitely isn’t defending the Soul Stone. So does all this mean that Vision might die in the end, or, at the very least, lose his Mind Stone? We’ll have to wait and see.